Radio Voicemail is about creating a new platform out of an obsolete medium, working with voicemail as abandoned digital space. 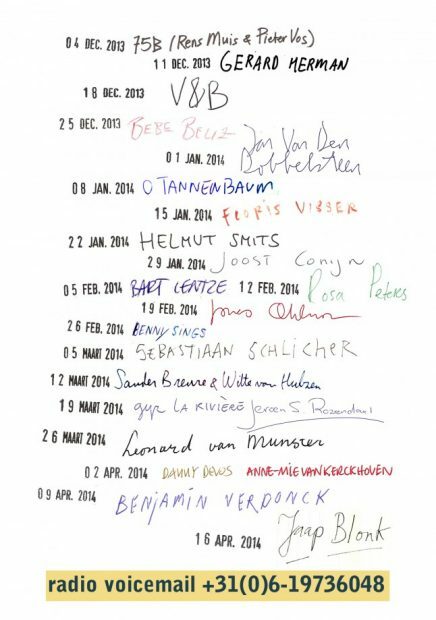 Radio Voicemail is an on going project, begun by Floris Visser in 2012. It is about to enter its fourth season at WORM (autumn 2016). It is a show of two minutes length, (sometimes recorded at WORM Sound Studios) and broadcast weekly through a cellphone voicemail. Each broadcast features a jingle, an introduction and a collage of sounds, speech or a performance. Visser asks other artists to submit work. 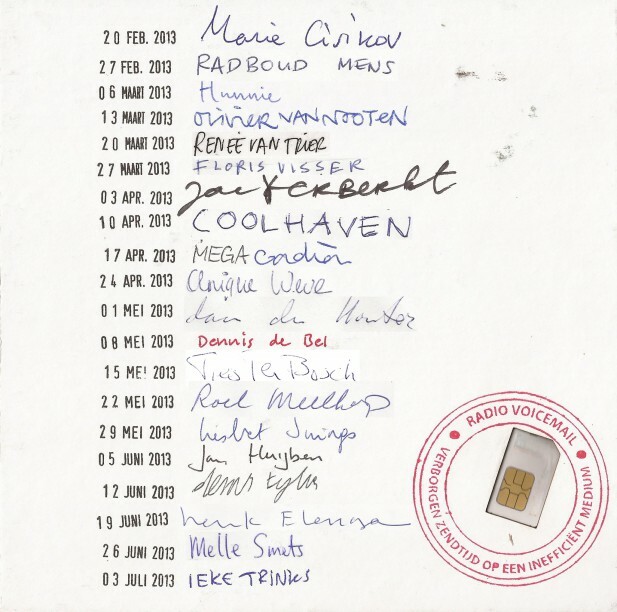 The contributor list is now a long one, with names such as Radboud Mens, Anouk Visee, Helmut Smits, Dennis de Bel, Rosa Peters, Abner Preis, Frans van Lent, Amy Suo Wu, Cancernoise and Visser himself, all making broadcasts during previous seasons. A new show is broadcast each week. 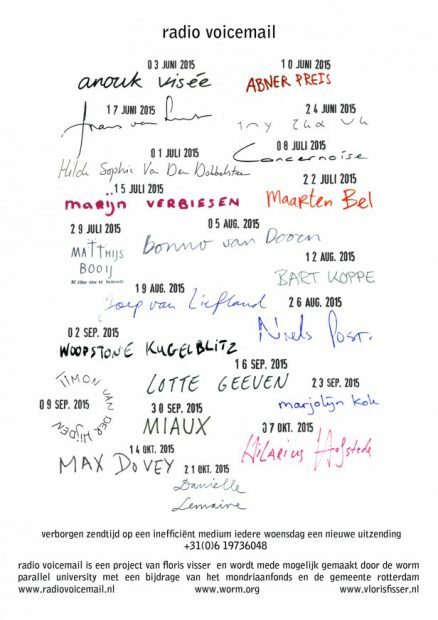 To advertise the shows, Visser installs a concrete plaque on the outer facade of WORM with the names and broadcast dates of the artists involved engraved in it. Once a new show is broadcast, the contributor’s name is scratched out by a WORM employee. Previous Radio Voicemail shows have been released on a simcard by WORM, which held a pre-installed phone number and enough credit to listen to every show once more. Radio Voicemail is een project van Floris Visser en wordt mede mogelijk gemaakt door de Worm Parallel University met een bijdrage van de gemeente Rotterdam en het Mondriaan Fonds. The 2013 Radio Voicemail series is available to buy in the Underbelly shop.